MATTRESS maker Private Frank Percy Hanlon was waiting in the trenches for his call of duty on a railway line when a mortar shell exploded near him and another soldier. 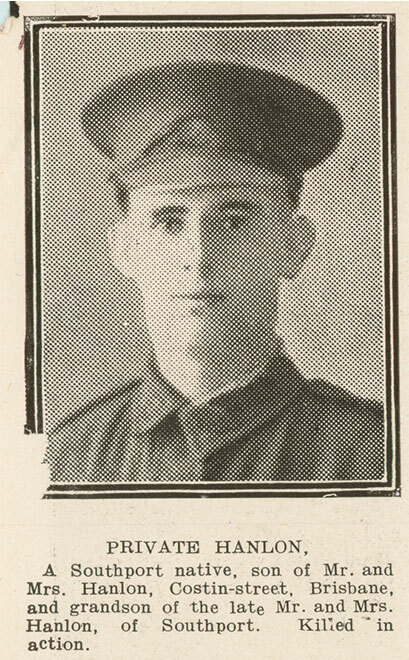 Fellow soldiers wrote eyewitness reports confirming the “rather slim and rather quiet” 20-year-old was killed “instantaneously” on April 23, 1917, around 800 metres away from Bullecourt, France, where days later emerged one of the bloodiest battles the Australian army had endured. Private Hanlon had only turned 20 three months earlier, enlisting in the army when he was only 19. Private Victor Harry Carby was in the burial party, and made a cross for his mate near where Private Hanlon had died. Within weeks that site was destroyed, as the battle between the Australians and British Army against the Germans that killed thousands of men left nothing in the ground behind. Though his body was never found again, he was honoured at the Villers-Bretonneux Memorial. Fr Edward Sarsfield Barry, a Catholic chaplain to Australian soldiers and the first priest at Our Lady of Victories Church, a war memorial in Bowen Hills, notified one of Private Hanlon’s nieces about the tragic death. Almost one hundred years later, The Gap parishioner Tom Vanderbyl jumped on the Internet and discovered letters pinpointing the precise location where his great-uncle, Private FP Hanlon, had died. “We got a fair bit of stuff from the web; there’s a great access to great materials now and resources online,” Mr Vanderbyl said. “If you know the name of the person you’re connected to and you list it in the search, there’s a lot of websites and resources available to you. Among the official documents detailing Private Hanlon’s deployment, which began in Egypt and ended in Bullecourt, were letters from his “friends in the trenches” who reported where and how he died. After contacting the National Archives of Australia in Canberra, Mr Vanderbyl learnt the digitised documents accessible online were just the tip of the iceberg. “There was a mud map attached to one of these letters, drawn by one of his comrades, and it shows exactly where it was,” Mr Vanderbyl said. The mud map was not available online, but Mr Vanderbyl obtained a hardcopy of it from the Archives. “I took that mud map and took up a Google Maps of the whole area,” he said. “He was basically blown up next to an old railway line, and this no longer exists, but when you look at Google Maps you can still see the location of a railway line just by the trees and different colours. 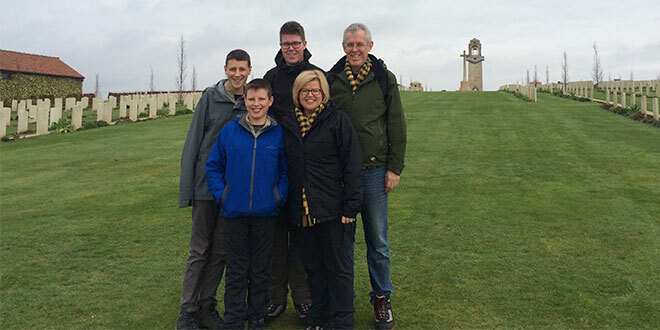 But it wasn’t enough to see the site on the computer – Mr Vanderbyl decided to tack on a side trip to Bullecourt during a family vacation to Europe. “When we were going on a trip to Europe to visit family and friends … we thought we’d take a side trip to go to the place where Frank Percy Hanlon was killed just to get a sense of it,” he said. “You go to Anzac Day parades and Anzac Day commemorations but we never actually connected more directly than that. In December 2015, the Vanderbyl family drove within metres of the site that took the life of his great-uncle 100 years ago this year. The thick mud – which Mr Vanderbyl said ran three metres deep – kept the family from standing on the actual site of Private Hanlon’s death. “Not traversable even by a car like that,” Mr Vanderbyl said, pointing to a photo of his family in the car just metres from the special site. 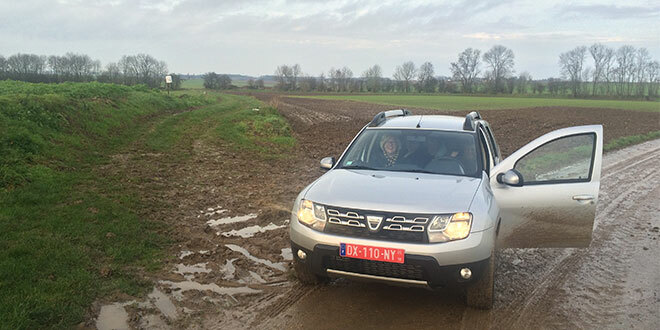 Family moment: In December 2015, the Vanderbyl family drove within metres of the site where Tom Vanderbyl’s great-uncle 100 years ago this year. The thick mud kept the family from standing on the actual site of Private Hanlon’s death. The site is the top left of the photo near the tree line. Photo: Tom Vanderbyl. “That’s as close as we could get because of that mud (which) you hear about it in Anzac stories. The Vanderbyl’s oldest son, Ben, was 17 at the time, just two years younger than when his great-great uncle enlisted in the First World War. “Imagine being out here doing this?” Mr Vanderbyl said. “His mother, Sarah Hanlon, who must have been my great-grandmother, she never really got over his death. “There was a letter, of which the first page is online, the rest must be in the files in Canberra, where you get the sense she hadn’t got over it years later. “You can see the anguish come through in her letters back and forth with the war office, trying to get more information. 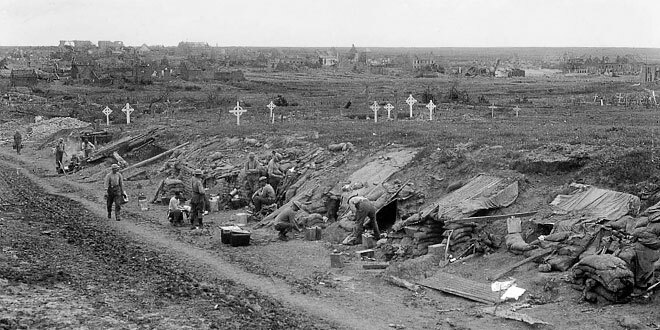 While in Bullecourt, Mr Vanderbyl said he could sense the appreciation the French of that town had for the Australians. “They still have a special place for Australians,” Mr Vanderbyl said. Heavy casualties: Troops billeted in a sunken road near Bullecourt on May 19, 1917.